July 28, 2015 (LBO) – Sri Lanka’s government and Google on Tuesday signed an agreement to cover the Island with 3G internet under ‘Google Loon project’. Sri Lanka is the first country in the world to have Internet access covering the whole country with the government support, Google Vice President and Project Leader on GoogleX Project Loon, Mike Cassidy said. Project Loon is the latest moonshot from Google[x]: balloon-powered Internet access. It is a network of balloons traveling on the edge of space, designed to connect people in rural and remote areas, help fill in coverage gaps and bring people back online after disasters. “With our system we use LTE which is a common protocol most of the telcos use around the world. So anyone with a smart phone would be able to get internet access. One of the key things we do is we partner with the local telcos. In New Zealand we partnered with Vodafone.” Cassidy said. It is expected to place 13 balloons above Sri Lanka over the next few months (One balloon is expected to last over 100 days) and internet service providers will have to connect this network through these ‘floating towers’ which will ultimately reduce their transmission costs. “Matara covered or Jaffna covered is now history. In a few months we will be able to say Sri Lanka covered,” addressing the signing ceremony Foreign, Telecommunications and IT Minister Mangala Samaraweera said. 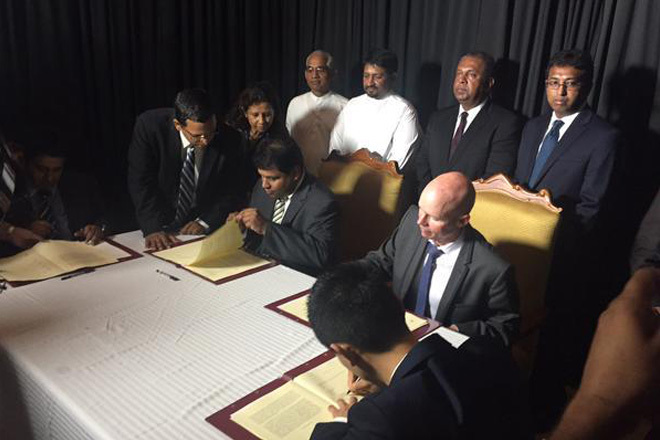 “As a result of this agreement, the entire Sri Lankan island – every village from Dondra to Point Pedro – will be covered with affordable high speed internet using Google Loon’s balloon technology.” Samaraweera said. The project is handled by ICTA with the collaboration of former Facebook executive Chamath Palihapitiya who now represents lotus flare, a leading mobile content provider.